Get a FREE Bedtime Message From a Disney Character! 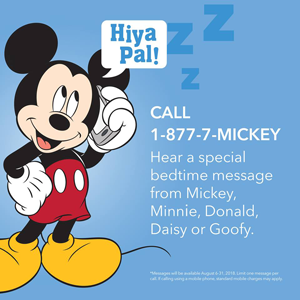 call 1-877-7-MICKEY (877-764-2539) and follow the prompts to get a Free Bedtime Message From Mickey, Minnie, Donald Duck, Daisy or Goofy. The toll-free phone number will run through August 31 and is available throughout the United States and Canada.